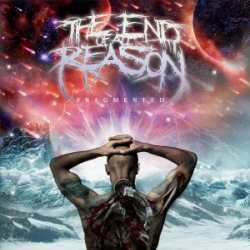 The End Of All Reason are an extremely brutal metal band from the Belgian capital Brussels. Their debut EP Fragmented offers an incredibly successful mixture of melodic death metal, pounding metalcore and astonishing progressive elements that altogether give you goose bumps. Despite only five songs, the EP is nearly half an hour long, which means that the tracks average six minutes. Don’t worry, the musicians know how to fill their songs with numerous breaks and different moods that are destined to keep your attention. The impeccable production in the hands of Aborted bass player Sven Janssens underlines the overall good impression. The opener Chariots From The Beyond is a fast, compact and intelligent composition that makes you hungry for more. Especially the murderous drumming and the virtuoso guitar sound manage to stand out again and again. The other tracks don’t stand back and surprise with progressive (Aeons In The Void) and hectic (Redemption) parts. Only the concluding Barbara has become somewhat harder, which works also well without reaching the level of the preceding material though. The future promises a lot for this young aspiring band. The End Of All Reason are already working on their first longplayer, which is planned to become a ten track concept album that will run for more than one hour. Finally the Belgian metal scene is back with some very good news!